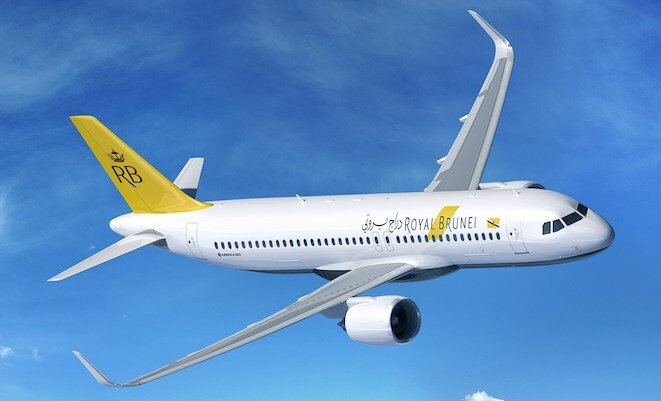 How the A320neo will look in Royal Brunei colours. Royal Brunei Airlines’ order for Airbus A320neo aircraft will potentially open up new routes into Australia, its chief commercial and planning officer says. The airline, which currently flies daily to Melbourne from its Bandar Seri Begawan hub, has seven A320neo aircraft on firm order, with options for three more. RB chief commercial and planning office Karam Chand says while the Australian market was looking a bit soft currently, he expressed confidence there would be an eventual pickup in demand that could support additional flights Down Under. Chand says the A320neo would offer an estimated 17 per cent reduction in fuel consumption compared to current generation A320 aircraft. That fuel saving could allow RB to return to cities such as Brisbane, Perth and Darwin with a narrowbody aircraft. “What it does is it gives us another avenue, a low-cost, low-risk avenue, to use a narrowbody aircraft to Australia – Brisbane, Perth, Darwin – as opposed to using a widebody,” Chand said in an interview on the sidelines of the CAPA Australia Pacific aviation summit in Sydney on Friday. “A widebody comes with a huge increase in cost so if you don’t get the revenue to go with that cost, that is a very risky proposition. First delivery of the A320 in RB colours was due in 2018. Bandar Seri Begawan to Brisbane was 5,444 kilometres, while it was 4,083 kilometres to Perth and 2,608 kilometres to Darwin, according to the Great Circle Mapper. The Airbus A320neo with 150 seats in a two-class configuration has a range of 6,150 kilometres, according to the Airbus website. RB’s current batch of four A320 have 144 seats, with 12 in business and 132 in economy, while its two A319s have 122 seats. And for long-haul flights, RB uses four Boeing 787-8 Dreamliners with 254 seats. Chand said the 787s had achieved a 25 per cent fuel saving compared with the Boeing 777-200 used previously to serve Melbourne, and London via Dubai, from Bandar Seri Begawan. “If you look at a round trip between Melbourne and London, you are saving about 100,000 litres of fuel,” Chand said. “It is a very sizeable cost so anything we can do to reduce fuel is welcome. Passenger loads from Melbourne has been pleasing, with a majority of those passengers connecting through to Dubai and London, Chand said. Ticket sales for points beyond London Heathrow and Melbourne were given a boost when RB retimed its flights with an evening departure at both ends. Moreover, RB had interline agreements in place with British Airways for points in Europe beyond London and Virgin Australia for onward connections to other parts of Australia. Chand said airline officials were weighing up whether to try to bring forward delivery of the fifth Dreamliner from its current 2018 delivery slot. What’ the problem Bob? If it’s got to do with Brunei’s recently phased Sharia Law implementation, I am sure most mainstream media sources portray it a evil and backwards. This subject requires better critical research and understanding before passing too much judgment. I would encourage getting to know the people, heritage and history. Yes, it has a different style of governance however with a population of less than a million, it’s a small player and is of no treat to neighboring countries in the region. Just because it does not reflect a successful capitalist style country, doesn’t mean it’s bad. It could be worse. On the subject of RB reopening to Australia? Great!!! Especially for backpackers, families with a budget, current and future students studying in Oz. Particularly from Perth & Darwin where the timezones are similar if not close. Departing in the morning and arriving the same day in the afternoon cuts out wasting a half or full day transit in KL or Singapore. How well RB will market these sectors? They really need to ‘SELL’ these seats and provide good connections in order to be competitive. You don’t necessarily need daily flights. Just good connections and worthwhile overnight options!